St.Martin's is a grade 2 star listed building and is mentioned in the Textus Roffensis dated 1122 A.D. and is almost 1000 years old. The Church has changed and developed over the Centuries to meet the changing needs of the Parishioners. The earliest dateable parts of the church are in the Early English Style characterised by the triple lancet windows at the East End. The glass in these windows would have been replaced many times, the current windows were designed by Moira Forsythe in the early 1950’s replacing the Victorian Glass destroyed by the blast from a flying bomb during the 1939-45 war. She also made the small window of St.John in the St.John Chapel. The tower and tower arch were added in the 13th century. The wooden screen at the base of the tower arch was originally across the chancel arch before that arch was enlarged in 1857 improving the connection between the clergy in the sanctuary and the people in the aisles. 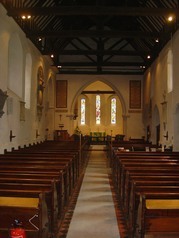 The Current Pews were installed in 1886 replacing earlier box pews. The St. John’s Chapel on the South side of the church dates from the 13th century and contains the memorial to Peter Collett, alderman and merchant of London who died in 1607. The recorded names of the rectors of the church are inscribed inside the church and date back to 1312. It is a particularly beautiful and peaceful sanctuary. The church has a ring of eight bells and an active bell ringing group. The church continued its development with the Brass Crosby Room, constructed in 2007. The extensive churchyard is a peaceful haven and a sought after resting place for parishioners, as it has been for hundreds of years. The names on the war memorial in the porch and the scattering of war graves are remembered each year on Remembrance Sunday. Different areas reflect the season - there are drifts of snowdrops in January, daffodils, primroses, cowslips and ladies smock in March, a sea of cow-parsley in June and a well kept lawn for summer weddings. The whole churchyard is carpeted brilliantly with leaves in the Autumn. In July 2003, a wild plant botanist identified 61 different species of wild flowers in the churchyard. It is continuously visited during the day with people tending the graves, some travel many miles. 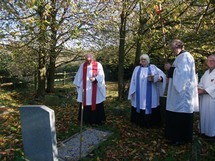 A churchyard extension was completed in 2014. 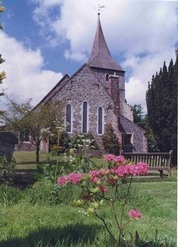 Local footpaths cross the churchyard and the "Walks" are well publicised by the council, so hikers often call into the church, which they are surprised to find open. It has no exceptional monuments, just the Lords of the Manor and their people. The car park is unusually large and provides good parking.